When working on the 5th edition of Intermediate Physics for Medicine and Biology, Russ Hobbie and I added a new homework problem about low Reynolds number flow. We ask the reader to analyze the classic example of “Stokes’ flow” or “creeping flow” around a sphere. (a) Show that the no-slip boundary condition is satisfied. (b) Integrate the shear force and the pressure force over the sphere surface and find an expression for the net drag force on the sphere (Stoke’s law). What fraction of this force arises from pressure drag, and what fraction from viscous drag? 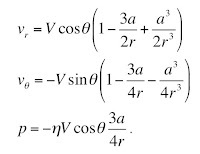 The reader should pause now, look up the expression for the divergence in spherical coordinates, and verify that the given velocity really is divergenceless. 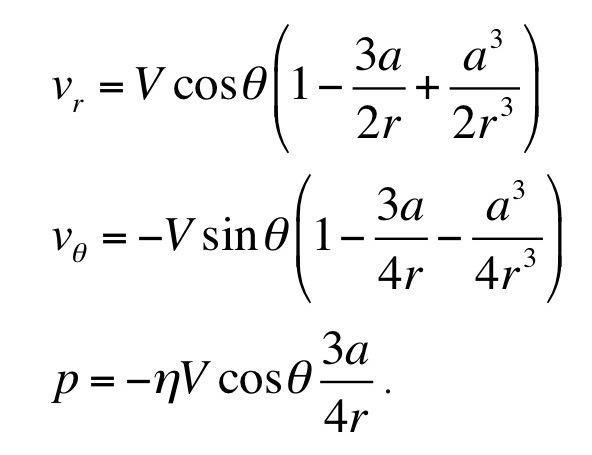 To get the expressions given in the new Problem 1.46, solve the Navier-Stokes equation assuming an incompressible fluid. In addition, the boundary conditions are 1) far from the sphere (r much greater than a) the flow is entirely along the z-axis with speed V, and 2) at the sphere surface (r = a) the radial component of the velocity vanishes because the flow is incompressible and the tangential component of the velocity vanishes because of the no-slip boundary condition. Using the definition of the dimensionless Reynolds number, Re (Eq. 1.62 in IPMB), we find that C = 12/Re. Often the Reynolds number is written in terms of the diameter of the sphere rather than the radius, in which case we get the more commonly quoted relationship C = 24/Re. In many fluid dynamics textbooks you will see C plotted versus Re (usually on log-log graph paper). At low Reynolds number C is inversely proportional to Re as creeping flow predicts. At high Reynolds number the relationship between C and Re is more complex because a turbulent boundary layer forms near the sphere surface. But that’s another story.